Chandra is rather harder to "ignite" than Jace; she rather reminds me of some of the flip cards from the Kamigawa block whose transformation conditions involved combat. The intention clearly is that you can hang back and untap her twice in one turn by casting spells, but that's almost as easily telegraphed as combat, and you won't always have spells on hand that you wanted to cast anyway. However, the payoff for successfully doing so is solid, and reminds me a little of Chandra Nalaar from way back in Lorwyn - indeed, her ultimate is even harder to survive. I'm not sure that getting there will be considered worth it in competitive play, but there are plenty of other places where I suspect she will fit in quite well. It's also worth noting that you can use her as a "straight" Prodigal Sorcerer variant: if the current situation makes that more useful to her, all you have to do is be careful about how many times you use her in one turn. 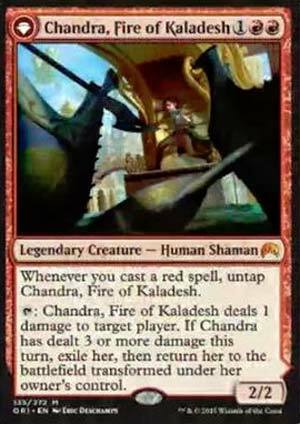 Today's card of the day is Chandra, Fire of Kaladesh which as a 2/2 for three mana that can do decent burn damage, but needs an almost Storm setup or survive an attack to trigger the transformation. As a planeswalker the +1 of a Shock every turn is quite nice in an existing burn deck while the -2 is somewhat weak and very situational. The -7 should be the top priority, particularly in Multiplayer, as it deals at least nine damage to every opponent before they can do much in response. Overall this is a a great planeswalker for a direct damage burn build, but needing external support necessary to trigger the transformation is a noticeable drawback. In Limited this is at worst a source of extra damage that runs down the clock and very much worth the three mana to cast and a first pick in Booster. Titan's Strength should be aggressively drafted as support to help trigger the transformation. In Sealed this is a compelling reason to run Red as a primary color, but if the pool lacks low cost Red spells such as Fiery Impulse it may force Chandra into the sidedeck. With every Chandra I read, I get a little bit sadder for this poor girl. Even pyromaster was merely okay. This version, her fifth, Is just groan worthy. A ping ability with an untap clause built in isn't bad, but Chandra, Roaring Flame's +1 and -2 are basically just a shock that's split between 2 abilities. It doesn't have to be this bad. But it is, and her Ult is just as bad, short of multiplayer, and your odds of getting that off is pretty difficult in single player. Even her flip check is hard to manage, unless you're pulling off some sort of combo or simply wasting your hand to flip this mediocre forgettable excuse for a planeswalker.